316 Fifth Ave. is slated for demolition to make room for a 40-story condominium building, plans show. MIDTOWN SOUTH — Time has run out for preservationists racing against the clock to save a century-old Fifth Avenue building. 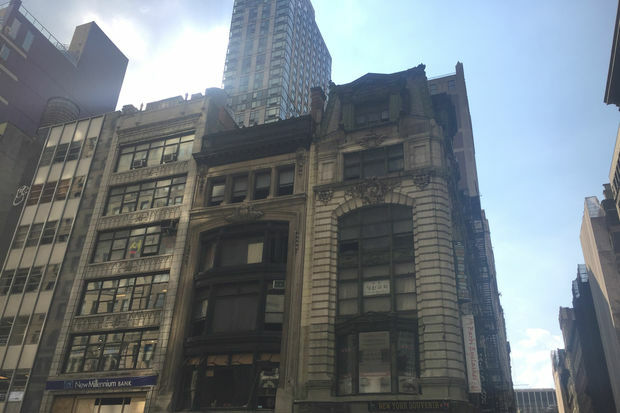 The city will not landmark the Kaskel & Kaskel Building at 316 Fifth Ave. because it's undergone too many changes over the years, officials said, meaning the 1903 building will likely face the wrecking ball. In an Aug. 11 letter to Councilman Dan Garodnick, who has been pushing for the property's designation, the Landmark Preservation Commission said that the building at East 32nd Street isn't eligible because of "extensive changes that reduced" its "historic integrity." "We have received a significant number of letters supporting the designation," wrote Meenakshi Srinivasan, the commissioner for the Landmark Preservation Commission. "[The Kaskel & Kaskel building] does not rise to the level of an individual landmark." The building originally housed a men's clothing store that catered to the rich and famous, according to the "AIA Guide to New York City." But changes to its roof line, the removal of its historic cornice on two facades and "extensive" changes to the ground floor over the years have made it less and less historic through the years, according to Damaris Olivo, a spokeswoman for the LPC. In order to consider designation, the LPC looks at the level of architecture, historic and cultural significance, the importance of it in the context of designated landmarks with similar features, and if changes to the building have affected its historic fabric. The LPC said it considered the property for landmark status in 2000, 2007 and 2015, while other, similar buildings within the Madison Square North Historic District were landmarked. "The building’s architectural character and typology as a small Beaux-Arts commercial building are well-represented within the Madison Square North and Ladies’ Mile Historic Districts, and by more prominent examples of individual landmarks, including the Knox Building at 452 Fifth Avenue," the commission stated. In July, developer Cottonwood Management and Kohn Pedersen Fox Associates filed plans to build a 40-story condo tower at 316 Fifth Ave., requiring the Kaskel & Kaskel building to be demolished, records show. Since that time, politicians, locals and organizations like the 29th Street Neighborhood Association have been pushing the LPC to landmark it rather than see it razed. George Calderaro, a member of the neighborhood association, was disappointed to hear the news Thursday. "The LPC rejection of Kaskel completely ignored our and Dan Garodnick’s urgent call for a district including these unofficial landmarks," he said in an email, adding that the group isn't giving up. "We continue to advocate calendaring a district to forestall this and more potential demolitions." Garodnick himself also refused to give up. "The Kaskel & Kaskel building is a stunning example of Beaux Arts architecture and is well deserving of landmark designation," he said in a statement. "It is extremely unfortunate that the Landmarks Preservation Commission does not agree. I will continue to work with advocates, neighborhood groups, and colleagues in government to protect this iconic structure and others in the area from meeting the fate that's befallen far too many of Manhattan's architectural gems."